How SATRA members can enhance sales of their products using a well-recognised and respected brand. For manufacturers, making their products stand out from those of their competitors is the key to success in sales. This is particularly important for makers of footwear components, who have to operate in an increasingly competitive global market. The SATRA Quality Mark – a third-party certification scheme that allows the use of the distinctive SATRA Quality Mark logo – is an example of how companies can raise their profile by demonstrating the quality and consistency of products they supply. 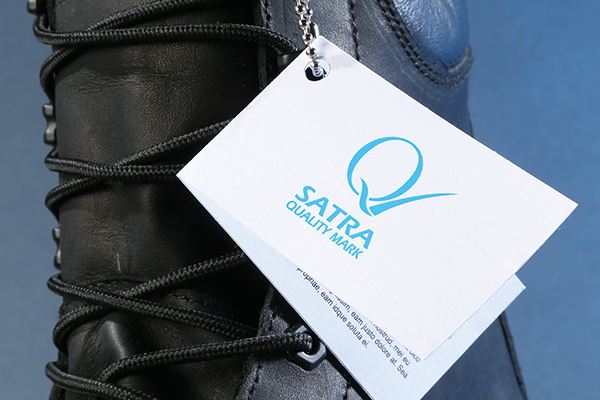 The SATRA Quality Mark has been awarded to many member organisations over the years; current holders include manufacturers of footwear, safety footwear toecaps, insole boards, threads, tapes, box toes, stiffeners and cushioning materials. The Quality Mark signifies that the product is from a manufacturing environment that includes ongoing product conformity assessment through a quality assurance system. Rigorous inspection and an appropriate testing regime help to ensure consistent production at an acceptable level of quality. The Quality Mark is not exclusive to the very 'top end' of footwear or components and can be applied to any product provided the specification is considered 'fit for purpose' by SATRA. The SATRA Quality Mark is exclusive to member companies. The logo can be applied to a wide range of components and materials used in products such as footwear, clothing, personal protective equipment (PPE), leather goods, accessories, luggage, furniture and carpets. In addition to components, finished products can also be certified, provided they satisfy a published standard or regulation or feature a specific performance property. For example, safety footwear can be covered if the product satisfies recognised PPE safety standards such as EN ISO 20345. More general footwear could be eligible if it incorporates an ‘attribute’, such as a high level of water resistance. differentiation of product in the market for competitive edge. i) agreement of the standards of performance with SATRA. These may be performance or safety standards appropriate to the marketplace, such as EN, ASTM or ISO, or SATRA-agreed performance levels that adequately demonstrate fitness for purpose or compliance with product claims, ii) an appropriate level of verification testing must be carried out, iii) an independently assessed quality assurance scheme must be in place. This does not need to be a formal ISO 9001 system, but must incorporate many of the requirements, such as control of incoming materials, control of critical manufacturing processes (including testing) and a review of customer complaints, iv) samples representing at least 25 per cent of the certified product range must be verified by SATRA on an annual basis, v) user information and product sheets (including use of the Quality Mark logo) to be approved by SATRA. An initial assessment visit is carried out to check on the manufacturing processes and the quality assurance system, including testing. Verification tests are carried out by SATRA on samples covering the whole range of products to be certified. Subject to a satisfactory audit and verification testing, the SATRA Quality Mark and the SATRA Approved Product Number is awarded. payment of an annual renewal fee, which covers an annual surveillance visit and retesting of samples from at least 25 per cent of the certified product range. In addition to administering the scheme, SATRA is committed to ensuring that its merits are known throughout the relevant industries. Articles in publications such as SATRA Bulletin, marketing at exhibitions and conferences and other activities are used to raise the profile of the Quality Mark and ensure that SATRA members operating the scheme get maximum benefit. Members already in the scheme are encouraged to use the logo and SATRA can supply appropriate artwork, print labels and design any company stationery incorporating the logo. Please email quality_mark@satra.com for further information on the use of the SATRA Quality Mark. This article was originally published on page 42 of the February 2016 issue of SATRA Bulletin.